Are you hyped for Disturbed?? They’re taking their new album, “Evolution,” on the road, and none other than Three Days Grace are joining them on the massive North American jaunt!! They’re headed to the Allstate Arena on Friday 8th March 2019 – it’s going to be EPIC!! Tickets are on sale now and disappearing fast – get yours while they last!! In keeping with its title, “Evolution,” is a new side of Disturbed, first hinted at when they dropped their stunning cover of Simon and Garfunkel’s “Sound Of Silence,” – personally endorsed by Paul Simon himself! One example of the band’s progression is the song “Hold On To Memories,” featuring a very new vocal performance from David Draiman, the band’s singer. "I wouldn't have had the balls to do this back then, to be honest," he said in an interview. ”I haven't allowed myself to go there vocally all these years. A lot of this was experimenting, and that experimentation in and of itself was incredibly fulfilling. This is stuff I haven't done since I was a teenager, for God's sake. It was a trip." Get ready to experience that trip live – do you have your tickets yet?? 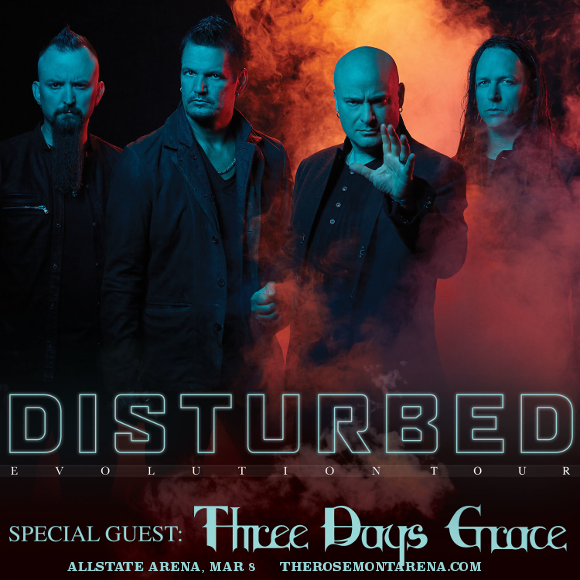 Grab ‘em NOW and get ready to hear all Disturbed’s new sounds in person!